Note: This article is a sidebar to this issue's feature story, "Write-off on the Range." Colorado farmers Dorothy and Norman Kehmeier have raised more than $500,000 in cash, simply by donating conservation easements on about 200 acres of their land. And they’d like other landowners to hear about it. "It’s wonderful," Dorothy Kehmeier says. She’s referring to an innovative Colorado program that enables struggling ranchers and farmers to cash in on easements. The Colorado Legislature approved the program in 1999, and it’s been running since 2000. It gives state income tax credits to landowners who donate easements to land trusts. The credits are equal to the value of the easements, and landowners can sell their credits to wealthy people who can apply the credits to their own hefty tax bills. The tax credits are better than tax deductions because they reduce the buyer’s tax bills dollar for dollar. "I’m a real advocate of landowners taking advantage of the opportunity the state has provided to us," says Dorothy. 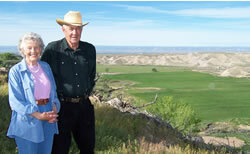 The Kehmeiers, both in their 70s, have a 300-acre farm near Eckert, on Colorado’s Western Slope. Norman’s side of the family has farmed in the area for three generations, and Dorothy has done so for 55 years. At various times, they’ve raised cattle, pigs and chickens, and they’ve grown apples, peaches, corn, oats, barley and alfalfa, without getting much ahead. By 2000, Dorothy says, "We realized, we’re getting old, and it was hard to get a hay crop in without the equipment breaking down." But they didn’t want to resort to subdividing their land and selling off some of it, as other landowners in their area have done. So when the state’s easement program began, they jumped at the opportunity. They donated four easements to the Black Canyon Regional Land Trust, and found a buyer for their tax credits through the nonprofit Conservation Resource Center in Boulder, Colo. Typically, for every dollar of tax credit, the buyers pay 90 cents, thereby reducing what they owe the state by 10 percent. Ten cents of what the buyers pay goes to various officials and middlemen, so the sellers end up with 80 cents on the dollar. With the cash, the Kehmeiers have bought better equipment, and 49 more acres of land, which relatives had owned. "We kept that land in the family," Kehmeier says. She and her husband don’t know anything about the people who bought the tax credits, other than the names on the checks, she adds. Such selling has become popular throughout the state. In 2004, landowners claimed about $50 million in tax credits for donating easements, estimates Mike Strugar, head of the Conservation Resource Center. Most of those credits were sold, and his organization handled about $17 million of those sales, he says. Some of the buyers are high-income business owners who seek state-tax reductions every year, and some are people who’ve sold businesses or big blocks of stock and face a huge tax bill in a single year. One of his clients bought $8 million in credits in one year, he says; about a dozen have bought a million dollars’ worth in a year. Many of the sellers of the tax credits are cash-poor landowners, much like the Kehmeiers, Strugar says. The program "really levels the playing field. The (income tax breaks) used to mean a lot to 5 percent of the (landowners), and nothing to 95 percent. Now, it means something to everyone." That’s one reason the Colorado Coalition of Land Trusts helped create the program, says Kris Larson, head of the coalition. The working ranchers and farmers "have been the hardest people to reach with any (tax) incentive, around the country," Larson says. Larson also praises the Colorado program for being "adventurous." Colorado and Virginia are the only states with active programs for selling tax credits for donated easements. Colorado allows landowners to sell up to $260,000 in credits per year. Still, Colorado’s record-keeping on easements is as loose as most other states’. The Colorado Department of Revenue doesn’t even total up the amount of credits that are bought and sold in the state: Those figures appear only on the taxpayer’s tax return. A few news stories have indicated the program may encourage some appraisers and landowners to inflate the value of easements improperly. But only the taxpayers and tax agencies know the details of any problematic deals. "Those transactions, as far as any audit activity, are confidential," says Larson. The land-trust coalition helped push a measure through the legislative session that ended several weeks ago, giving the Colorado Department of Revenue specific authority to challenge the dollar values in easement appraisals, Larson says. And over the past several weeks, the federal Internal Revenue Service quietly notified about 150 Colorado landowners that their easement donations are being audited, says Mark Weston, a Colorado appraiser. "That’s never happened before here," he says. "The IRS and the Colorado Department of Revenue want to find out if (inflated appraisals are) a bad problem, and how bad it is." In the meantime, landowners like the Kehmeiers can’t say enough about the tax credit system and how it helps working farmers and ranchers. In their home county, one of the state’s poorest, landowners donated 38 easements last year, and sold tax credits for at least $3.8 million, she says. "That’s economic development for Delta County."